Pernix Adaeque Simius (PAS), is an ambitious crew roaming the seas on Emerald Ocean, flying the flag of Kanata. The crew was based on Wensleydale, and was originally created on the retired Sage Ocean by Interfering (known as Aze on the other oceans) and Sigzag. 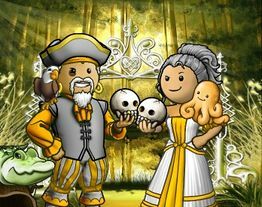 The crew was ruled by Inanna after she took over the position in January of 2006 until she passed on the captain's hat to Gwiddon in March 2007. On the 4th of March, 2006, after thorough discussion, Pernix went independent for the second time in its history. On the 18th of March, 2006, Pernix became one of the founding members of Quixotic Tangent. On the 1st of June, 2006, Orestes merged with Pernix. On the 12th of June, 2006, Pernix became the founding crew of Candy Coated Chaos. On the 3rd of April, 2007, Pernix moved to the flag Purity of Essence. On the 28th of August, 2007, Pernix moved to the flag Good Grief. By late 2010, the crew had left Good Grief to become independent. Pernix is not a demanding crew. We do not run daily pillages, or even weekly if we don't feel like it. We do not require specific standings to achieve higher ranks within the crew, just show us that you're willing to learn. Literacy is a must. Above all, just enjoy yourself. This is a game, hence, we are here to have fun. This page was last modified on 27 March 2017, at 12:10.